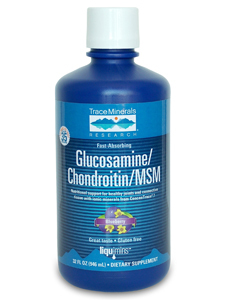 Glucosamine/Chondroitin/MSM (Methyl-sulfonyl-methane) with ConcenTrace® is a dietary supplement that provides nutritional support for joints and connective tissue.† Glucosamine sulfate combined with chondroitin supplies cartilage with the vital building blocks it needs to stay supple and healthy.† MSM is a natural sulfur compound the body critically needs to maintain proper joint health.† Supercharged with ConcenTrace® for improved absorption, this formula provides your body with the nutrients it needs to support healthy joints.† For more research and information on ConcenTrace®, visit our website. Suggested Use: SHAKE WELL. Take 1 to 2 tbsp. daily (1 capful = 2 tbsp.) alone or mixed into water or your favorite beverage. Rinse cap after each use. REFRIGERATE AFTER OPENING. Other Ingredients: Purified water, natural vegetable glycerin, natural fruit juice concentrate, natural blueberry flavor, citric acid, xanthan gum, potassium sorbate and potassium benzoate (for freshness). Allergen Info: contains shellfish (crab, shrimp), gluten. Also contains over 72 naturally occurring ionic trace minerals found in seawater.